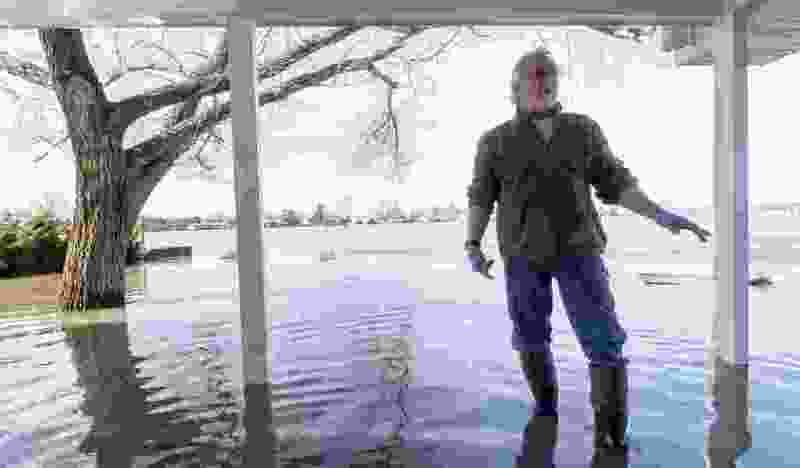 (Kent Sievers | Omaha World-Herald | The Associated Press) Tim Bazar stands on the back deck of his flooded house Friday, March 22, 2019, in Bellevue, Neb. Flooding in Nebraska has caused an estimated $1.4 billion in damage. The state received Trump's federal disaster assistance approval on Thursday. Now, as floods strike across the Great Plains, would be a great time for the Republican elected officials in Iowa, Nebraska and Missouri to show how committed they are to their claim of wanting small government. Republicans love to snicker at Ronald Reagan's famous quote, "The nine most feared words are, ‘I'm from the government and I'm here to help'." Now would be a great time to demonstrate, not just with words but with action, that you are really committed to that ideology. Please tell them that you believe that all this talk of "climate change" is nothing but a big government conspiracy, promulgated by corrupt officials at NASA, NOAA and those liberal-infested universities with their liberal science professors. Please tell FEMA officials that you trust your elected Republican political leaders — President Trump, your senators and representatives, along with your beloved talking heads — Rush Limbaugh, Sean Hannity, etc. — who have all been telling you for years and years that “climate change” is a big hoax. Now is a great time to put words into action.